Installing a bathroom fan with no attic is not much different from any other fan installation. It's just a matter of figuring out the best route for running the exhaust duct. What is important is that the fan does its job of removing excess moisture that can lead to a multitude of problems, from peeling paint to unhealthy mold and mildew. As you install your fan, you will be working with high-voltage electricity. If you do not have excellent electrical skills, get a knowledgeable friend or relative to assist you with this aspect of the job. Start by shutting off the electricity at the electrical panel or fuse box. Use a voltage tester to check the wiring to make sure the electricity is off. Place a seal or note on the electrical panel so that no one accidentally turns the power back on. The optimal location for a bathroom fan is between the toilet and the shower. The best way to proceed with a bathroom fan installation with no attic is to run the venting duct between the ceiling joists and through a nearby exterior wall. Determine where the ceiling joists are, and do not cut into the joists for any reason. Follow the manufacturer's instructions for installing and wiring your particular bathroom fan model. For bathrooms with an existing ceiling light fixture, most people simply purchase a combo fan/light model to replace the fixture. Use the existing wiring and switch to turn the fan and light on and off simultaneously. If you want a separate switch or if you want to install a timer, you may need to install a new three-wire conductor from the switch box to the exhaust fan unit. If you do not have power in your bathroom ceiling, you may have to tap into an existing receptacle to bring power to your exhaust fan or run a completely new circuit from the electrical service panel. Before you cut your outside duct opening, drill one pilot hole and stick an object through the opening to flag the location. Go to the exterior of your home and make sure there are no obstructions or potential problems that would be caused by water vapor emitting from the duct in that location. Use a reciprocating saw or a 4-inch hole saw to cut the opening. Secure the duct cover to the exterior, and seal around the perimeter. 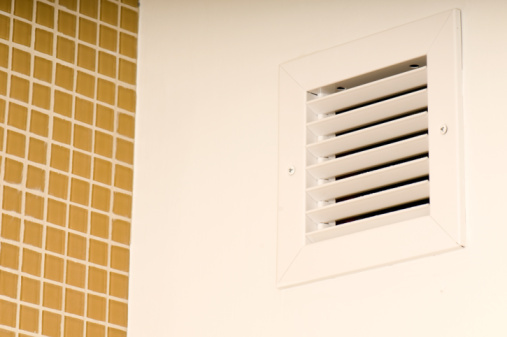 Install a duct cover or vent cap with a damper to prevent back drafts and insect infestation. 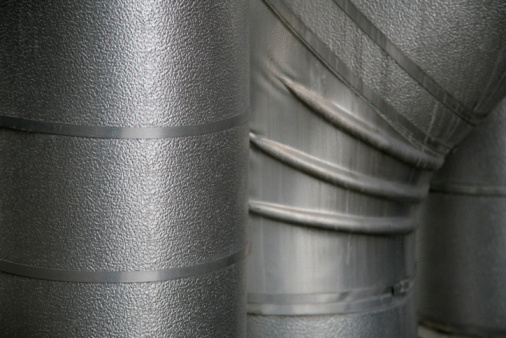 Although you can use flexible aluminum or plastic duct (check your building codes), rigid galvanized pipe provides a more durable installation. Rigid pipe also allows for better airflow and quieter operation. If the location is too tight for rigid pipes, use a combination of the materials. Seal all pipe connections with foil duct tape. When installing the duct, slope the pipe 1/4 inch for each foot of the run. This will ensure that condensation does not trickled back to the fan and cause water damage.